Death, displacement and disability have combined to diminish our interpersonal worlds with each year of advancing age. The increased neediness of old age has me relying too heavily on the people that remain, especially the daughter who has taken on the burden of being available to me. As I age, I reluctantly become accustomed to receiving help; as a result, I find myself growing more helpless, diminished. I hope to diminish my dependency on my daughter in favor of greater involvement in this spiritual community. It becomes a two-way mitzvah: When I am more involved, I can contribute to its success, and I can seek out productive and satisfying contact with others. I want to deepen those connections so that things are expected of me – not to move fast, and not to schlep the gear that encumbers us, but to help write and edit the things we are trying to say, for instance. Within the limitations of old age, I seek a place in the community as someone who can be counted on. 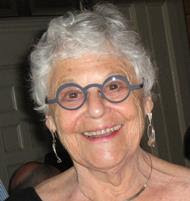 Sue Finkelstein is a retired psychologist/psychoanalyst. She has three adult daughters. She lives at Atria on the Upper West Side.